to officially establish the EUTF for Africa was signed by the European Commission, 25 EU Member States, Norway and Switzerland. The EUTF for Africa was established to deliver an integrated and coordinated response to the diverse causes of instability, irregular migration and forced displacement. We aim to deliver concrete results in a rapid and effective manner across these areas of focus. The EUTF for Africa provides a new impetus for EU cooperation on migration by creating a platform to reinforce political engagement and dialogue with partner countries in Africa, pooling together EU and other donors’ resources, and enlarging the EU evidence base to better understand the drivers and dynamics of migration. The EUTF for Africa also undertakes to build a comprehensive approach to support all aspects of stability, security and resilience, aiming at addressing the conditions that could be conducive to violence and destabilisation, and supporting governments in their efforts to improve security. Who does the EUTF for Africa support? The EUTF for Africa supports vulnerable and marginalised population groups at the forefront. Principal target beneficiaries include migrants and forcibly displaced people, their origin and host communities, and victims of trafficking in human beings and migrant smuggling. Potential migrants, and notably women and young people are strongly supported by a large range of actions. At institutional level, national and local authorities, civil society groups and community-based organisations also benefit from EUTF for Africa actions and play a crucial role in the identification and implementation of programmes. They also benefit from support through capacity building and training activities. The EU Emergency Trust Fund for Africa (EUTF for Africa) has two governing bodies: the Strategic Board and the Operational Committee. 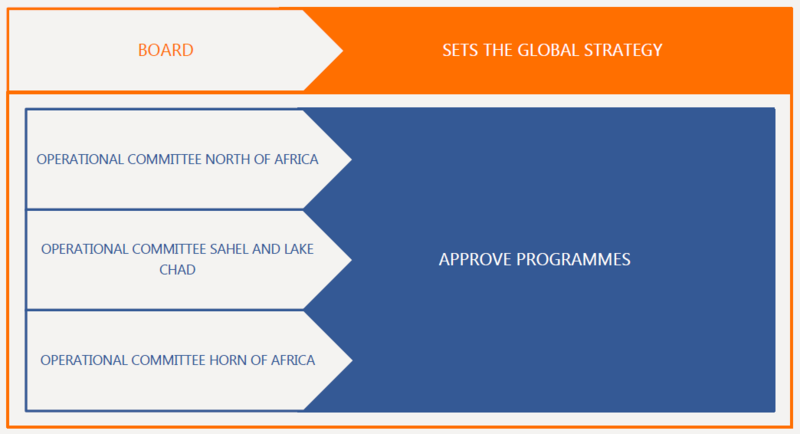 The Strategic Board sets the global strategy of the EUTF for Africa, meeting at least once per year. The Operational Committee adopts the actions to be implemented on the ground, and meets at separate sessions for each of the three geographical regions. Both bodies are chaired by the European Commission and are composed of representatives of the European External Action Service (EEAS), EU and non-EU donors (as full members), and representatives of the concerned African partner countries and regional organisations (as observers), who are invited to actively participate at both levels. Deciding upon amendments to the (the guiding document establishing the internal rules of the EUTF for Africa). Approving the annual report and annual accounts for transmission to the Strategic Board.